Anyone else in for a ticket to participate in the great event/cruise? It is just over three weeks away. Im in i need 2 tickets. Can i buy them saturday at the meet spot or ??? Shoot me a PM with your number and I will come meet you. Thank you to everyone that supported the cause by purchasing a ticket or donating to Camp Quality. TBMOTORING sold 33 tickets and raised over 100 dollars for this weekend's Poker Run. For anyone that would still like to be in the Poker Run or is in the Fat Guys Auto car show that morning - you can walk over to Shooters Tavern to register, get a ticket and start figuring out the mystery stops then when the show is over you can take your car on the Poker Run. Here's a link to some shots from the car show Saturday. At least someone noticed, good eye balls. 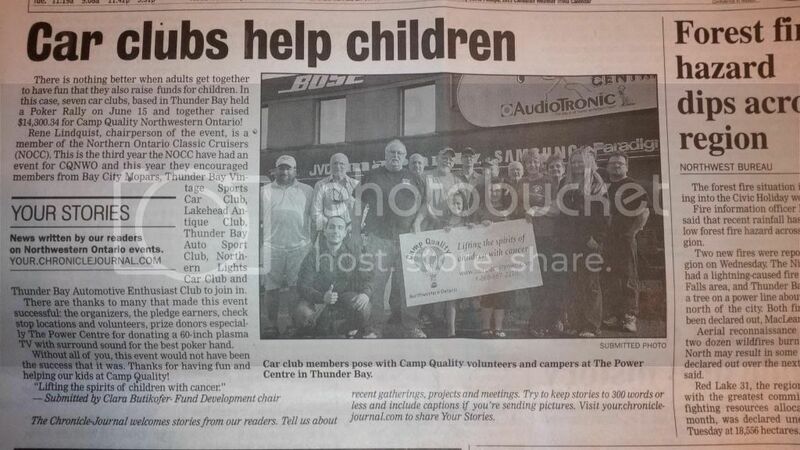 Also, we made the paper on Saturday Aug 3rd, 2013. Thanks goes out to everyone that participated in this event and helped raise money for the kids. Let's make next years charity poker run even bigger.